Wetland Indicator Categories estimate the probablity of a plant being found on a site classified as a wetland. The reported categories for each species are for the Atlantic and Gulf Coastal Plain (AGCP) region. 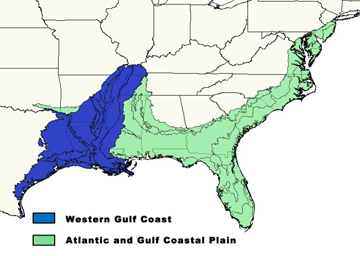 Seven of the species listed on this site have a different status in the Western Gulf Coast (WGC) subregion of the Atlantic and Gulf Coastal Plain. These are listed on the individual species pages, where applicable. Facultative Upland (FACU) usually occurs in non-wetlands, but may occur in wetlands.